On Tuesday, November 13, bright planet Venus will cease its westward trip through the stars of Virgo. On that date, it will pause and then commence travelling eastward (red path with labeled dates). In the pre-dawn southeastern sky that morning, the planet will appear only about 1 degree (a finger's width) to the lower left of the very bright, white star Spica. The nearby planet and the distant star will both fit together within the field of view of a backyard telescope at low magnification (orange circle). On the following mornings, Venus will slowly pull away from the star. Early morning risers who head out to work and school before sunrise should notice a very bright, star-like object in the east-southeast sky. Just a couple of weeks ago, this object wasn't there at all, but now it shines with such brilliance that it might as well be telling eastward-traveling commuters, "Look at me!" The object in question is the planet Venus, which is currently in the midst of one of its most spectacular forays into the morning sky, literally "vaulting up" into prominence. Contrast the planet's current activity to its most recent run as an evening object: On Jan. 9, Venus arrived at superior conjunction with the sun. From our vantage point here on Earth, Venus appeared to pass behind the sun, transitioning from a morning to an evening object. Not until late in February did Venus finally set an hour after the sun, giving casual viewers a glimpse of the object low in the western sky at twilight. And not until the end of March, almost two months after the planet's entry into the evening sky, could Venus be viewed in a completely dark sky. Venus was at its best in June, setting at the rather late hour of 11 p.m. local daylight time. Then, came a long, slow slide back toward the sun, which lasted through the summer. 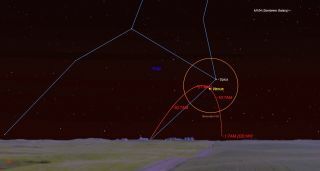 Venus was at its brightest and most interesting for telescope users from mid-August through mid-September, when it set before the end of evening twilight. By early October, the planet had, for all intents and purposes, disappeared from our evening sky. On Oct. 26, Venus came to inferior conjunction, passing between Earth and the sun and moving into the morning sky. Considering what happened earlier this year, you might think that you won't get your first morning view of Venus until sometime in early December. But quite the contrary: Venus is already here. And the view is only going to get better in the days and weeks to come! For morning visibility, Venus in now in a literal and figurative sense "rising to the occasion." Two weeks after the planet reached solar conjunction, it now rises before the break of dawn, more than 90 minutes ahead of sunrise. From here on, Venus will rise 3 minutes earlier each day, so that by Dec. 17, it will rise 3 hours and 45 minutes before sunrise. It will blaze in a completely dark sky for more than 2 hours before the first hints of morning twilight appear. Venus will reach the pinnacle of its brilliance on Dec. 1, when the planet will shine at an eye-popping magnitude of -4.9. That's 19 times brighter than Venus' nearest planetary competitor, Jupiter, and a full 25 times brighter than Sirius, the brightest of all stars. If you live in a rural location with minimal light pollution, you'll readily be able to make out that the planet casts a visible shadow. And if you follow Venus right on through sunrise, the planet will be visible to your naked eye in full daylight: a tiny, white speck plainly evident against the blue daytime sky. In some ways, we could even regard Venus as this year's Christmas Star, glowing with stunning radiance "… in the east," recalling the quote from the Bible's Book of Matthew. By telescope, Venus now appears as a large, narrow crescent that will gradually get smaller and thicker as we progress through November and December. By the end of this year, the planet will appear about half as large as it does this week, while its current slender, crescent shape will fatten to almost mimic a "half-moon" by New Year's Day. It's probably best to view Venus when morning twilight is well-advanced rather than in full darkness to cut down on the planet's dazzling glare. After reaching its high point for morning visibility in mid-December, Venus will take a long, slow slide back toward the sun, rising about 1 1/2 minutes later each morning from New Year's Day through late March. By then, Venus will rise as dawn breaks, roughly 100 minutes before sunrise. The planet will get gradually lower and rise progressively later during the spring. By late June, Venus will rise less than an hour before sunrise, ultimately vanishing into the bright dawn twilight by July. Before closing, here's a quick explanation of why Venus makes such a spectacular entrance into the morning sky this month while it seemingly dawdled as it attained visibility early this year in the evening sky. In January, when Venus transitioned from the morning to the evening sky, the planet was on the far side of the sun as seen from Earth, nearly 160 million miles (257 million kilometers) away. So, even though Venus was approaching us after passing solar conjunction, it did so very slowly at first and took many weeks to move away from the sun's vicinity. In contrast, at its Oct. 26 conjunction with the sun, Venus was much closer to our planet, at only about 26 million miles (42 million km) from Earth. As a result, Venus appeared to move much faster. And the ecliptic (the imaginary line in the sky along which the sun, moon and planets appear to travel) stands nearly perpendicular to the eastern horizon at this time of year, so Venus seems to leap almost straight up into the sky. So, if any of your friends or relatives tell you that they saw a "strange UFO" on the way to work or school recently, you can now set them straight. It's not E.T. It's only Venus. Joe Rao serves as an instructor and guest lecturer at New York's Hayden Planetarium. He writes about astronomy for Natural History magazine, the Farmers' Almanac and other publications, and he is an on-camera meteorologist for Verizon FiOS1 News in New York's lower Hudson Valley. Follow us on Twitter @Spacedotcom and on Facebook. Original article on Space.com.